The stock market rally continued for a second day after Donald Trump beat Hillary Clinton, a reaction few expected. The Dow rose 218 points Thursday and closed at a record high for the second day in a row. And why not? It's fitting that following the most unusual presidential election campaign in recent history, the stock market is also reacting in atypical fashion. Many investors worried that a Trump win would be bad for stocks. In case you haven't heard this before, the market hates uncertainty. And Trump is uncertainty on steroids. What's more, stocks have historically gone down the day after Election Day. It hasn't mattered much if it was a Democrat or Republican winning, if the incumbent party (or president) was re-elected or if the outcome was considered an upset. According to data from Jeff Hirsch, editor of the Stock Trader's Almanac, the average decline for the S&P 500 the day after Election Day between 1932 and 2012 was 1.1%. But the S&P 500 rose 1.1% on Wednesday. The market only rallied on 6 of the past 21 post-Election Days. Stocks even fell in 1980, after Ronald Reagan, the hero of the modern Republican Party, defeated Jimmy Carter. And the market dipped nearly 1% after Reagan's landslide win over Walter Mondale in 1984 as well. Stocks plunged 5.3% in 2008 after Barack Obama was elected. Of course, those were unusually tumultuous times for the market and economy. But the S&P 500 also fell 2.4% after he beat Mitt Romney in 2012. The last post-Election Day rally prior to this year was in 2004. The S&P 500 rose more than 1% after President George W. Bush was re-elected, defeating John Kerry. But stocks also rallied after Bill Clinton won a second term in 1996. They fell slightly when he beat the first President Bush in 1992 though. The market usually gets over election jitters pretty quickly though. The S&P 500 has risen an average of 0.2% in the first three days after Election Day going back to 1932. And the market is up more than 1%, historically, between Election Day and the end of the year. So can stocks keep rallying as Trump starts to make Cabinet picks and give more details about his economic and foreign policies? Perhaps. 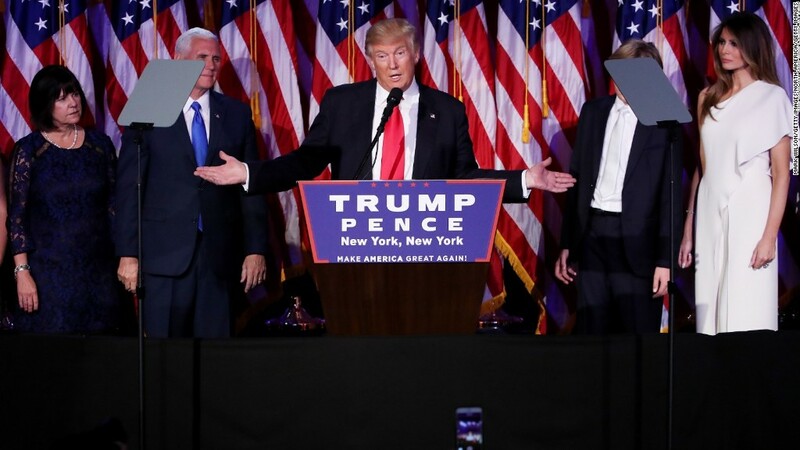 Despite his mercurial nature during this long, nasty election cycle, Trump has already won raves from investors for his more measured acceptance speech. Trump's remarks pleasantly surprised many since he dropped much of the bombast that was a hallmark of his throughout the campaign and pledged to be a president for the whole country. Shares of many banks, drugmakers, oil companies and construction firms all rallied sharply Wednesday and rose Thursday as well. 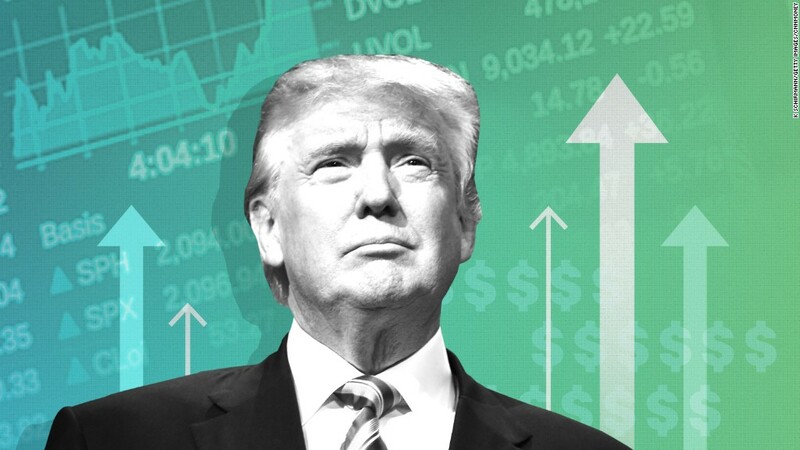 Investors now seem to be betting that Trump, combined with a Republican-controlled House and Senate, may look to unwind some of the regulations on financial services companies put into place during the Obama administration. There are also hopes that Trump will propose plans to boost infrastructure spending, drill more for oil and also push back on some of the attacks against drug and biotech companies for price hikes on key medications. But there are still questions about who Trump may appoint to slots on the Federal Reserve over his term. That will impact the markets. Who Trump may choose to add to the Supreme Court could also have an effect on stocks. Tough talk from Trump about Mexico and China have also raised some worries that he could start a trade war which could be damaging to the markets, jobs and overall economy.